Right now, you are probably thinking that the birthday cake would taste like cardboard. What crazy person would make a whole wheat birthday cake? I have to admit to not being the baker of the family. My husband bakes all of our bread (see: How To Bake Your Own Healthy Bread in Five Minutes a Day) and he found King Arthur Flour in Walmart. He brought home a bag of flour called "White Whole Wheat" and started using it instead of all purpose flour. Both types of flour are made from wheat, but there is a big difference. In case you didn't know, wheat is a grain from a grass that is full of nutrients. But, after milling it and bleaching it, the nutrients get taken out of the grain. Whole wheat flour contains many more of the nutrients that get removed during milling. That is why it is called "whole' because it can contain the entire grain from the wheat. White flour (all purpose) does not have the entire grain and it is therefore very light and fluffy. It makes great baked goods that don't contain the brown tannins from the wheat flour. But, the problem is it lacks nutrients and ends up a "junk" food. What if you could have both white flour (fluffy) and the nutrients combined? The White Whole Wheat Flour has all the nutrients of the whole wheat berry, with a milder flavor and lighter color, and it is unbleached. It does not have exactly the same nutritional profile has whole wheat flour. Whole wheat has 14% protein content, white whole wheat has 13%, and all purpose has 8-11% protein content. The biggest difference I found between the all purpose and White Whole Wheat is the fiber content. All purpose flour has 0.8 grams dietary fiber per 1/4 cup versus white whole wheat at 3 grams per 1/4 cup! That is more than 3 times as much. Whole wheat flour has 4 grams of dietary fiber per 1/4 cup. You will have to alter your recipes a little bit to accommodate the extra protein. For example in my overnight pancakes recipe (see: A Grab And Go Breakfast With Staying Power), the bakers at King Arthur suggested that I add 1 tablespoon more of milk to make the white whole wheat flour work. King Arthur offers both a website The Baking Circle and a phone number for baking questions - 802-649-3717 Baking Hotline to aid you in the transition to White Whole Wheat. King Arthur Flour is giving away a 5 pound bag of King Arthur's White Whole Wheat Flour and a one issue of their newsletter The Baking Sheet to a lucky Snack Girl reader. Just comment in the space below about your homemade baked good that could benefit from White Whole Wheat flour. A 5 pound bag of King Arthur's White Whole Wheat Flour and a one issue of the newsletter The Baking Sheet. Comment below on your favorite homemade healthy baked good. Comment on our wall about your favorite homemade healthy baked good. The winner will be announced on October 13th, 2010. You will have 2 weeks to e-mail us back with your home address so we can mail the prize. I could use this in my pancake recipes, or new fall cookie flavors! love making no knead bread! Cookie recipes! They always come out less desirable when I use half white and half whole wheat! I would use this flour in my pumpkin bread! They're all good, but you do have to be careful with the flour to moisture balance and allow the flour to soak a little in the liquid ingredients to allow for more absorption and a better rise. I also use a little more baking powder than conventional recipes to accommodate the heavier whole wheat flour. I'd like to try my pumpkin muffins with it they have a little sugar and 1 tablespoon oil. I already use it in my pumpkin and zucchini breads - and I substitute apple sauce for the oil. My kids LOVE it. I'd love to try it in my poppyseed bread that needs a complete healthy makeover! I have only used whole wheat flour for about 4 years. It's yummy and only adds a slight texture difference. Also - I cut my fats in half by using Flaxseed Meal as a substitute. Healthy food is delicious. @Juliette - I was also skeptical - but I dug deep to find major differences between whole wheat and white whole wheat and I couldn't find any. White whole wheat is just a lighter strain of wheat - you still get a little whole wheat flavor - but less of what people dislike about whole wheat. I recently started substituting whole wheat flour in all my recipes. Sometimes it works, sometimes not. For the most part it seems to work and yields slightly denser baked goods with much more fiber...so I'm happy! For cookies and other treats I would recommend going 1/2 and 1/2 with all-purpose and whole wheat. But maybe the white whole wheat is what I should try? I would love to try the white wheat flour. I always look at it and thinking about my holiday cookies this time of year then get nervous to try it! I've got to add the flour to my Walmart list - I'm going this weekend. Time to start baking! I would use it to make pizza crust for my husband's handmade pizzas. He makes both thin crust and deep dish pizzas so the extra protein and fiber would be a good thing. I absolutely would use this is my banana/chocholate chip pancakes. YUMMO! I love this idea of white whole wheat!! I typically to a 1/3 wheat 2/3 AP ratio in my baked goods. This would really help me make my food (I bake ALL the time!) healthier and tastier. I can't wait to try it! how yummy does this give away sound! i say lets make pizza or some yummy raisin cookies. This would make pumpkin choc chip cookies even better! Health food!!! 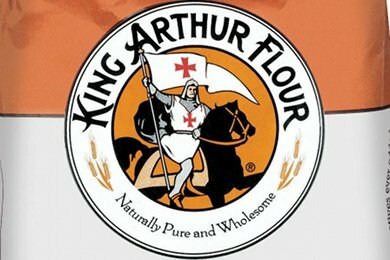 I get King Arthur's newsletter and would love to try their flour, but what's the difference between whole wheat flour and whole grain flour? I've always looked for "Whole grain" in a store bought bread. I think this would be great in all my holiday cookies, at least we would be getting a little more nutrients in our splurges.